Researchers find missing link between H. pylori bacteria and gastric cancer risk. The ulcer-causing bacterium Helicobacter pylori can directly interact with stomach stem cells, causing the cells to divide more rapidly, according to a new study by researchers at the Stanford University. The increased cell division was observed in mice, however, the data findings could explain why H. pylori is a risk factor for gastric cancer in humans, the researchers state. The team used 3-D microscopy to identified colonies of the bacteria deep within human stomach glands, where stem cells and precursor cells that replenish the stomach’s lining reside. The study is published in Gastroenterology. The team state that one of every two people has H. pylori in their stomachs. It’s one of the few organisms capable of surviving the harsh acidic environment. While the majority of people remain asymptomatic, in about 15 percent of those infected the bacteria causes painful ulcers, and in another 1 percent the bacteria contribute to stomach cancer, the third-most lethal cancer worldwide. The researchers add, that although the infection can be successfully treated with antibiotics, those who develop cancer are often unaware of their condition until the tumour is large enough to interfere with stomach functions. The bacteria will be brewing for many years, and when the cancer starts to cause symptoms it may be too late. H. pylori has long been known to evade stomach acid by taking shelter in the protective mucus that covers the organ’s epithelial cell lining, state the team. The bacteria grow directly on the surface of the epithelial cells, injecting a signaling protein, called CagA, to trick the cells into delivering nutrients to where the bacteria are. The signaling protein also stimulates stem cells to divide faster, the current study found. The data findings showed that epithelial cells are short-lived and constantly replaced by new ones that originate from stem cells residing in tiny glands throughout the stomach. The stem cells divide into precursor cells, which populate the middle of the glands. Then precursor cells give rise to the mature epithelial cells. The passage into and out of the gland is narrow, its diameter is only about four times wider than a single H. pylori cell, and filled with mucus. Previous research in mice showed that some H. pylori swam into the glands, but it wasn’t known if the bacteria actively grew there, or if this behaviour occurred in humans. A more systematic study was necessary, but the difficulty lay in finding appropriate human stomach samples to image. While stomach biopsies are plentiful, they provide shallow samples from the top layer of the stomach and omit the deeper tissues the researchers needed as going all the way through would be like giving the patient a big ulcer. The researchers came up with the idea of sampling stomach tissues removed during weight-loss surgery. These samples came from healthy stomachs, in which H. pylori was not actively causing ulcers or cancer. After identifying tissue infected with particular strains of H. pylori, they used confocal microscopy to reconstruct 3-D images of the glands from four stomachs with H. pylori. All four showed colonies of the spiral-shaped bacteria clustered about two-thirds of the way into the gland, where fast-dividing precursor cells reside. Unexpectedly, the results showed a smaller number of bacterial colonies at the base of the glands, where the stem cells reside. When the team went back to their mouse models, they discovered about 30 percent of the glands colonized by H. pylori had bacteria at the base of the glands. This unanticipated finding shed light on how H. pylori could influence cells to turn cancerous. Cancer is thought to develop slowly as the cell acquires mutations in the DNA that override cellular controls and increase cell proliferation. Even though H. pylori had been shown to manipulate cellular controls, the mature stomach’s epithelial cells don’t live long enough to acquire mutations. The data findings showed that once they reach the surface of the stomach, the cells live for about 24 hours. It’s hard to imagine H. pylori doing something to those cells that would lead to cancer. However, the stem cells are extremely long-lived, and H. pylori infections often start in childhood. So there would be plenty of time for the bacteria to interact and change the stem cells. To observe how H. pylori might modify stem cell behaviour, the researchers turned to a mouse strain used in developmental biology. The stem cells of the mouse express fluorescent markers, which allowed the scientists to identify the stem cells and track their daughter cells. The results showed that two weeks after infection with H. pylori, the mice’s glands were noticeably longer and more inflamed than those of uninfected mice. The stem cells in the glands of infected mice were also dividing more actively. The researchers suspected CagA might be involved. To confirm this hypothesis, they infected mice with H. pylori that can’t inject CagA, and while the bacteria still colonized the glands, they observed less inflammation and stem cell growth. Experts state that by using cutting-edge technology to identify a subpopulation niche in the stomach, the research has opened up a new field of investigation. 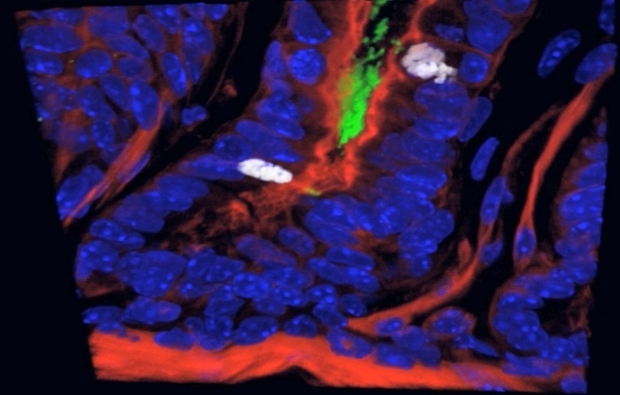 In this image of stomach tissue, the H. pylori colony (in green) sits near two actively dividing cells (in white). Courtesy of Amieva lab.